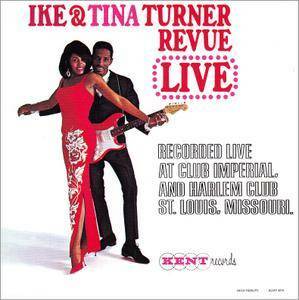 With most classic R&B acts, we feel lucky to get one genuine live recording - in the case of Ike & Tina Turner, by contrast, we have an embarrassment of riches in the way of concert recordings from the early- to mid-1960s, and it started with this Kent Records release. Issued in 1964, soon after they left Kent, it captured 35 minutes of their live act, from the Club Imperial and the Harlem Club in St, Louis. In addition to Tina Turner in an extended rap attached to "Please, Please, Please," we also get Jimmy Thomas in a rousing version of "Feel So Good," Venetta Fields' mournful, magnificent "The Love of My Man," Bobby John on the smooth, soulful, soaring "Think," Stacy Johnson doing "Drown in My Own Tears," Robbie Montgomery's "I Love the Way You Love," and Vernon Guy singing "Your Precious Love".